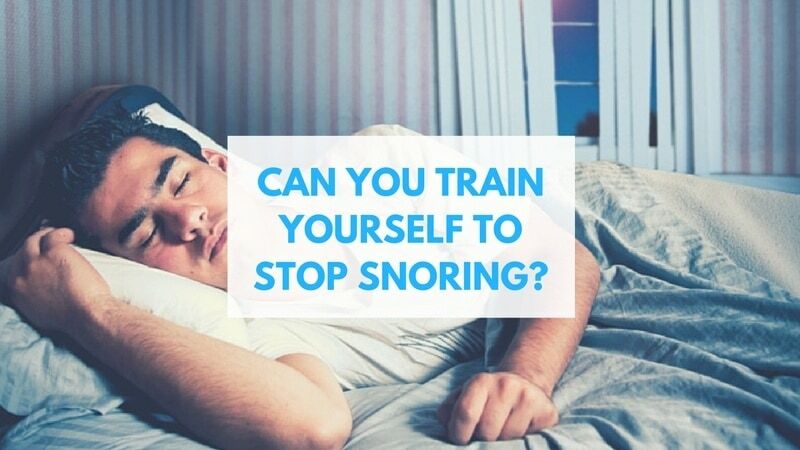 » Can You Train Yourself to Stop Snoring? Snoring is often looking upon by many as something that’s quite amusing yet also both common and harmless. Many of these people haven’t woken up with an elbow in their side as a partner tries to wake them up or make them change position so that they will “shut up with the snoring already!”. Not only can snoring disturb people around you, it may also affect the quality of your own sleep and the noise you make might even wake you up. Is it possible then to train yourself to stop snoring? Quite possibly, keep reading! Before trying to cure yourself of the almighty snore you first need to understand what you’re up against. According to the NHS (National Health Service), snoring is a snorting and/or rattling noise that a person makes in their sleep. It is caused by the soft tissue in your head and neck vibrating during the process of breathing in and breathing out. Your tonsils, nasal passages and the soft plate (located at the top of your mouth) are including in this soft tissue vibration. During sleep, the air pressure in these key areas is altered, with airways narrowing as they relax. This relaxation and vibration, as well as the blockage of your passages (when you have a cold), cause snoring. If there are medical reasons behind your snoring, such as sleep apnea you will need tongue to see a GP as this is a different issue to your common garden snoring. There is hope however for the snoring masses and their families as many successful tips to stop snoring or at least reduce snoring have been identified. Snoring can be embarrassing and you may feel like you’re the only person with this terrible affliction. Let us tell you, you are most certainly not. Snoring is a common occurrence with as many as one in four snoring, male and female, across all ages. Snoring celebs such as Tom Cruise, Prince Harry and many more are known for their snoring too and we’re sure many of them have also found themselves looking at training themselves to stop or reduce their snoring affliction. If you need outside help don’t be shy about it, many people snore so do seek out help from your GP if you have concerns. The breathing techniques taught as part of a yoga lesson help to strengthen your diaphragm and altogether improve oxygen flow, promoting a much better quality of sleep. Deep and even breathing could certainly, alongside the stress-relieving aspect of yoga help with snoring reduction or elimination. Have a look at these yoga exercises for snoring and give some of them a go, it certainly won’t hurt. Many claim that undertaking tongue, jaw and throat exercises have helped to train or strengthen their body against the scourge that can be snoring. It certainly makes sense as these areas are all connected, and the soft tissue you will be working out here is what is responsible for those noisy vibrations. Dr. Geraldo Lorenzi-Filho, the author of a recent acclaimed study on exercises aiding snoring, published in the CHEST journal, also reported encouraging results regarding certain exercises reducing snoring as part of his research. There are a number of lifestyle changes you might make which will also help reduce or even eliminate snoring. Losing weight, sleeping on your side as opposed to your back and not drinking alcohol before bed (this relaxes those vibration-loving soft tissues further) are all very valid changes which may have a significant effect on snoring, especially losing excess weight. Combatting nasal congestion with sprays or perhaps a humidifier in the bedroom are also practical and effective ways to help you stop snoring naturally. There are a number of mouthpieces and other snoring-related aids on the market which in some cases provide significant improvement of snoring and relief. Most of these devices, even our top-ranked #1 device, SnoreRx, are not intended to treat obstructive sleep apnea, they are only for the treatment of snoring. Why not explore some of these while working on your physical and breathing-related exercises and lifestyle changes. Every little bit helps! There are a number of stop-snoring mouthpieces available and which one is best for you will depend on your individual needs and wants. These snoring mouthpiece reviews will hopefully help you narrow down your search and possibly even help you find the perfect mouthpiece for you. This is a serious sleep-related condition which may require GP or specialist treatment depending on the severity of the condition. While many of these tips to stop snoring might help up to a point it is important to familiarise yourself with the signs and symptoms of sleep apnea so that you can identify the correct answer to “why do you snore?” and get appropriate support. This article could help! Snoring really isn’t a joking matter, with it affecting your own sleep and that of your partner and other members of your household. When you snore and your own sleep is disturbed this is likely to have a knock-on effect on your morning, your day and long-term your health. Regular and effective sleep is essential to encourage the body and the mind to recover from the rigors of your day and so promoting a decent night’s sleep is important. When it comes to snoring solutions and training your body to stop snoring it takes time. There are no quick or instant fixes and so commit yourself to whichever of these techniques you are happy with and continue your exercises for a period of time to give your body a chance to take on board whatever strategy you are employing. Training implies something that has to be learned and that does take time so be patient. Do you have any other hints, tips and tricks for helping to reduce or stop snoring? If so we, and no doubt our readers would love to hear about it so feel free to comment below.